This publication consists of: 1) a CD containing all vocalizations in MP3 format, announced in English, with each track containing a single file of all vocalizations for each species, and 2) a data DVD containing a separate MP3 file for each individual vocalization without announcements. Also included is a comprehensive booklet in both digital (PDF and Excel) and hard copy format, containing recording information for each cut. 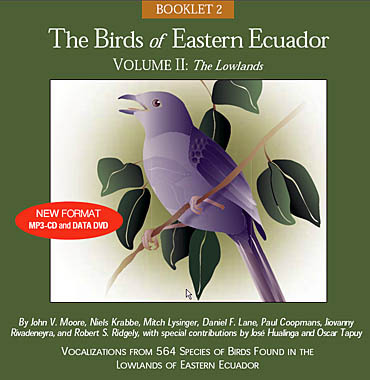 This publication is meant to replace and greatly expand upon the 4 cassettes currently offered for sale which specifically cover bird vocalizations of Ecuador’s eastern lowlands. We present 2317 separate sound recordings of 564 species. Included are the sounds of nearly all the birds predominantly inhabiting the life zones of Ecuador’s eastern lowlands. The habitats of these lowlands include forests of various types (such as várzea and terra firme), clearings, black and white water lakes and rivers, and islands. Our goal is to achieve a high degree of completeness, not only including song repertoires but also a wide variety of calls and mechanical sounds for each species. 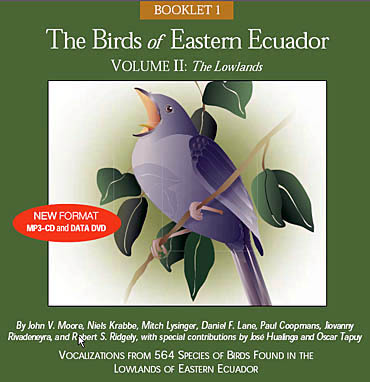 This publication is the final part of a series that covers bird vocalizations from all major life zones in Ecuador, a country with one of the richest avifaunas in the world.